The first tooth is one of the most anticipated events in a baby’s life. Parents scan their babies’ mouths for days, looking for a gleam of white. Then one day there it is, the first little tooth peeking through the gum. Soon parents will need to think about taking care of those cute little choppers, and that means shopping for the best toddler toothbrushes. Pediatricians advise cleaning babies’ mouths even before teeth come in. Giving gums a wipe and a gentle massage reduces bacteria and also gets baby accustomed to the process. Learn more about gum care from Humana. Babies’ teeth should be brushed as soon as they appear, but you won’t want to use a standard toothbrush. You’ll want to pick a toothbrush especially made for your child’s age. You’ll also want to do everything possible to make tooth-brushing fun. Fortunately, that’s easy at first. Teething babies love to have their gums rubbed, and that should be part of your tooth cleaning regimen. A little later, getting your child’s teeth brushed may be more challenging, especially when your toddler learns to say no. Most toothbrushes for toddlers are inexpensive, which is good because sometimes it takes several tries to find a model that works for your little one. Also, baby toothbrushes should be changed frequently, and it’s wise to discard children’s toothbrushes any time they have had an infection or other illness. Innovative designs are making brushing those tiny teeth easier. When you first start brushing your baby’s teeth, you’ll mostly be massaging the gums while cleaning around the one or two teeth that have appeared. There’s no set time or place to do this, but dentists say you should be doing it twice a day. As with most new experiences, your child will adjust to it more easily if he is in your arms. There’s no need for a sink for this early brushing. Just have a washcloth or paper towel on hand to catch the drool. A tiny bit of toothpaste is all that is needed at first. Think of the size of a grain of rice. When your child turns 3, that amount can be increased to about the size of a pea. For years dentists have recommended not using fluoride toothpaste with very young children because they haven’t mastered spitting and will be swallowing the fluoride. In high concentrations, fluoride is toxic. In 2014, amid growing concerns about tooth decay in the very young, the American Dental Association (ADA) revised its guidelines. The ADA now advises using fluoride toothpaste from the very beginning, but simply controlling the amount used. Fluoride plays a role in toughening tooth enamel and preventing cavities. Although most public drinking water contains fluoride, some households use bottled water for drinking and may not be getting much fluoride through the water. Also, babies often don’t drink a lot of water. Breastfeeding moms are often told that their nursing infants don’t need water at all. Although fluoride is a powerful ally against tooth decay, overexposure is a concern. If children ingest too much fluoride, their teeth may exhibit stains or even small pits, a condition called fluorosis. Parents should exercise caution in giving children other products that contain fluoride, such as mouthwashes. They should also teach their children not to swallow toothpaste. The industry has made some toothpaste so tasty that children may be tempted to eat them. Most children don’t do a good job of brushing their teeth until they are around 6 years old. It is hard for them to reach the back teeth and the inside surfaces, and most children lack the manual dexterity and the patience to do a good job. In the interest of dental hygiene, many parents continue to brush their children’s teeth for years. A workable compromise for some is to let the kids handle most of the tooth-brushing, but be sure that the teeth get at least one good adult-assisted cleaning a day, preferably at bedtime. A related issue is children who won’t brush long enough. Dentists recommend a brushing time of at least two minutes. One way to pass time while brushing is to brush to music. Some toothbrushes have built-in timers or music tracks to make this easy, but you can also do it on your own. Lots of songs clocking in at around two minutes. Some families use the ABC song as their tooth-brushing song, but it will need to be sung about three times. “Happy Birthday” is another song that most little kids know. It will need to be sung twice. The ADA also recommends these seven songs about tooth-brushing that may help to motivate your child. Young children should be supervised while they are brushing their teeth. It’s hard to believe, but every year toothbrush injuries account for hundreds of hospital visits. There is a reason why most kids’ toothbrushes bear a warning about adult supervision being required. Most toothbrush injuries involve lacerations or bruises of the mouth, palate or throat. The usual cause is children walking or running with a toothbrush in their mouths. Most of these injuries are not serious, but why take a chance? Toothbrushes with rigid handles are not toys, and children should not be allowed to carry them all over the house. A second safety concern with toothbrushes is a child swallowing the bristles. Children should not be allowed to chew on toothbrushes that have nylon bristles. Toothbrushes that are used as chew toys are likely to break or at least release some of the bristles. Like most small foreign objects, bristles will probably pass through the digestive system without incident, but no parent wants to take that chance. The manufacture of toothbrushes involves the use of very tiny staples to hold the bristles in the toothbrush head. A child who manages to break the brush head while chewing on it could also swallow some of the tiny staples. Interested in exactly how a toothbrush is made? You can watch this cool video from the Discovery Channel. Although the use of a toothbrush involves some hazards, not using one is also hazardous, with the main danger being tooth decay. According to experts, the number of very young children with cavities is on the rise. Over 10% of two-year-olds and almost half of all five-year-olds have cavities. Tooth decay is the most common chronic disease of children aged 6 to 19, according to the Centers for Disease Control and Prevention (CDC). Although several factors may be at play, such as the move to non-fluoridated drinking water, most experts say that our eating habits are most to blame. Many American children snack frequently, often on sweet treats or on carbs that begin to turn to sugar in the mouth. Fruit juices also promote tooth decay. After a number of years in which juice was seen as a healthful drink for kids, experts now recommend that its use be kept to a minimum due to concerns about both tooth decay and obesity. Nutritionists recommend that children be given whole fruit instead whenever possible. New guidelines from the American Academy of Pediatrics recommend no juice at all before the age of one. After that time, they recommend no more than four ounces per day. The academy also suggests that juice not be given in bottles or sippy cups and that juice not be given at bedtime. Parents can also water down juice so that it’s less sugary. Brushing regularly and staying away from sugar are habits that promote dental health for all ages. But there are a few other things that parents can do. Replace Brushes Often. Toothbrushes should be replaced when the bristles become bent or frayed, or about every three months. Take Kids to the Dentist. The ADA now recommends that babies be taken to the dentist when they cut their first tooth or around the first birthday. For sure they should have had a checkup by their second birthday. Using a children’s dentist improves your chances of having a hassle-free visit. Start Flossing Early. As soon as babies have two teeth that touch, they should be flossed. This usually occurs around age two or three. Before that time there’s usually space between their teeth. You may find using a floss pick easier than using a strand of floss. Children are usually around 8 or 10 before they are able to floss competently on their own. Consider a Sealant. When your child has molars, ask the dentist about using a sealant, which can reduce cavities in the molars by up to 80%. Parents have a lot of things to worry about, but the time and effort they spend on their children’s dental health will pay off richly in the long run. Finger Toothbrushes. These make great first toothbrushes for baby. They fit on an adult’s finger and are used to rub baby’s teeth and gums. They are usually made of silicone. Teether-Toothbrushes. Some products are actually a cross between a teether and a toothbrush. These usually have soft silicone bristles and are suitable for use when the baby has only a few teeth. Manual Toothbrushes. These are smaller versions of the toothbrushes that adults use, but some have unique features that make toddler dental care easier. Look for ones that are labeled with the ages they are suitable for instead of those that just say for kids or children. Electric Toothbrushes. Although these are great for older kids, they aren’t a hit with many toddlers. The noise of the motor can be scary, and the scrubbing action of the brush can feel too intense. Also, many popular kids’ models are recommended for ages 3 and up. Only a few are designed for younger kids. Another way of classifying toothbrushes is by stages, but these stages are defined by the manufacturers, so they may differ from one company to another. Generally speaking, however, if you are talking about toothbrushes for toddlers, you will be looking at Stage 1 and Stage 2. Some toothbrushes have been accepted by the ADA, but the list is quite short. For that reason, we have not limited our choices to those brushes. Learn more about the ADA Seal of Acceptance. A finger toothbrush is a silicone sleeve that fits over a parent’s finger so that the parent can easily rub a baby’s gums and clean freshly-sprouted teeth. Finger toothbrushes are sold on the Internet by many concerns, but most parents are picky about what they put in their babies’ mouths. The Pro-Sys Baby Finger Toothbrush is sold by a recognized dental company, not by a manufacturer of novelties. Pro-Sys is part of Benco Dental, a private company that supports dental practices. In 2011 the company got into the business of designing toothbrushes. Some Pro-Sys toothbrushes have the ADA Seal of Acceptance. This finger toothbrush does not have that seal, but there aren’t any finger toothbrushes on the ADA’s Accepted list. This finger toothbrush has bristles on one side for cleaning and nubs on the other side for massaging. It comes in a choice of colors. It is made of 100% soft silicone and is free of BPA and other toxins. It is made in China. Some parents complain that finger toothbrushes are too tight, but one that did not fit snugly could come off the parent’s finger and be a choking hazard. Parents with large fingers may not be able to use this style of toothbrush. Enjoyable for Babies. Teething babies enjoy having their teeth cleaned and their gums massaged with the Pro-Sys Baby Finger Toothbrush. Easy to Clean. This toothbrush can be placed in the dishwasher for easy cleaning. Safe Material. This silicone brush is free of BPA, lead, and phthalates. Twin Pack. This product is sold by twos, so moms will have a spare. Warranty. This product carries a money-back guarantee. Hard to Take Off. Some parents had a hard time getting this their finger off once they got it on. Above Average Price. 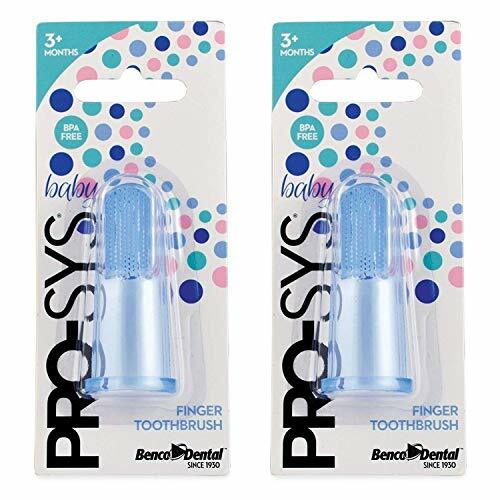 The Pro-Sys Baby Finger Toothbrush is priced higher than many similar items. Baby’s first toothbrush doesn’t look much like a toothbrush, at least in this version created by Baby Buddy. It’s described as a chewing toothbrush. Made of soft silicone, it has a loop for a handle, and the brush part is a semi-circle. The brush head has six rows of bristles to simultaneous clean top and bottom teeth at the same time and to reach the top and sides of all teeth. Baby’s First Toothbrush is part of a full suite of dental aids for babies created by Baby Buddy. This part of the system is designated for babies from four months up. Pop this toothbrush in the freezer for extra relief for a teething baby, and pop it in the dishwasher or sterilizer for easy cleaning. Although moms said that their babies loved this item, they regarded it as more of a teether than a toothbrush, noting that it is difficult to line up the bristles with the teeth. Still, at this age babies don’t have a lot of teeth, and just chewing on the brush probably does a pretty good job of cleaning. The Baby Buddy line belongs to Compac Industries, a family-owned company based in Decatur, Georgia. Baby’s First Toothbrush is made in China and packaged in the U. S.
Part of a Comprehensive Plan. The Baby Buddy Baby’s First Toothbrush is part of a 6-stage plan for oral hygiene for babies. Versatile. 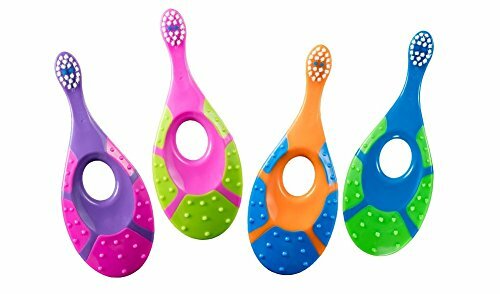 This combination of a teether and a toothbrush works for both cleaning and soothing. Chillable. It can be placed in the freezer and used to soothe achy gums. Easy to Clean. This toothbrush can be placed in the dishwasher or sterilizer. Affordable. The Baby Buddy Baby’s First Toothbrush is reasonably priced. Picks Up Fuzz. Like many products made of silicone, this one attracts lint and fuzz, but it can be easily rinsed off. There’s a great story behind the Baby Banana. In 2001 a toddler was running with a baby toothbrush when he fell down. The toothbrush punctured his soft palate. The toddler recovered but inspired his grandmother and aunt – a dental hygienist — to invent a safer toothbrush. The Baby Banana was born. The Baby Banana has become such an icon that there are lots of rip-offs and spin-offs, but why not go with the original? It’s 100% food-grade silicone and made in the United States. The company now makes the Baby Banana in a variety of colors and in a version modeled after an ear of corn. The original Baby Banana is intended for babies up to 12 months old, but there’s also a toddler version for children up to 24 months. Award-Winning. The Baby Banana has won numerous awards for design. Versatile. It works both as a toothbrush and as a teether. Easy to Hold. The banana peels form easy-to-hold handles. Chillable. It can be placed in the freezer and used to soothe sore gums. Easy to Clean. This toothbrush can be placed in the dishwasher or boiled for up to ten minutes. Safe Material. This product is free of BPA, lead. latex and phthalates. Affordable. The Baby Banana is reasonably priced. Picks Up Fuzz. Like many silicone products, the Baby Banana attracts lint and fuzz, but it can be easily cleaned. Missing Bristles. Some moms have noticed missing bristles after their children chewed on this product, causing them to worry that the bristles could have been swallowed. This value-packed set contains tools to care for a child’s mouth from birth to six years. 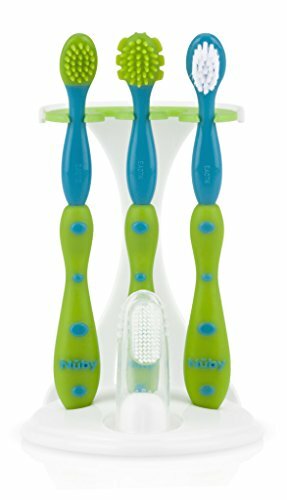 The Nuby 4-Stage Oral Care System includes a finger toothbrush, two massaging brushes, and one soft-bristled toothbrush. And it’s cute enough that you won’t mind seeing it on your counter. The finger toothbrush can be used from birth. The first massaging brush is designed for use on babies who are at least three months old. The second massaging brush is for babies 11 months old and older. The bristled toothbrush is designed for children who have teeth. Nuby suggests that you ask your child’s dentist when to start using the “real” toothbrush. When this brush wears out, you can replace it with a Nuby kids’ toothbrush, sold separately. Nuby was founded in 1970. Based in Monroe, Louisiana, it has won numerous awards for its products. The company website does not say where its products are made. Comes With Stand. The Nuby 4-Stage Oral Care System comes with a convenient stand. Grows With Baby. This set has just the dental tool you need for each age. Easy to Hold. The handles are easy for toddlers to grip. Safe Material. This product is BPA free. Soft Bristles. Most buyers said that the bristles of the regular toothbrush were soft enough for a toddler. Budget-Friendly. You can buy the whole set for the price of one or two brushes. Bristles May Come Out. Some users said that the bristles of the regular toothbrush come out if the toothbrush is chewed on. Since FridaBaby won the attention of the parenting world with its nasal aspirator, the company has been branching out with more products to make parenting easier. SmileFriday the ToothHugger is one of these. 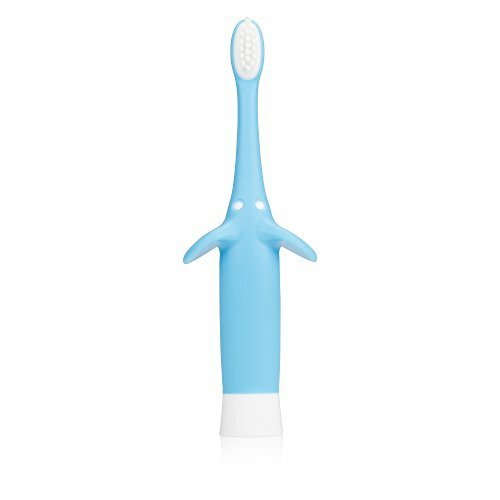 With a three-sided head to brush all tooth surfaces at once, the ToothHugger lives up to its name. Moms will like the suction cup that holds the toothbrush upright, so it doesn’t touch germy bathroom counters. The handle is soft and ergonomically designed for little hands. Recommended by many dentists and pediatricians, this toothbrush is “responsibly made” in China for FridaBaby. 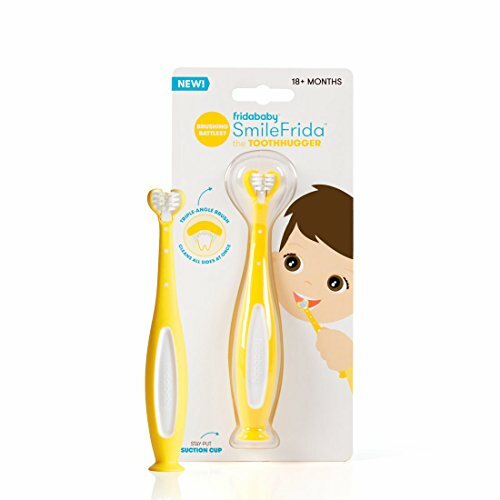 SmileFrida the ToothHugger is recommended for children from 18 months of age. Easy to Hold. The handle of SmileFrida the ToothHugger is soft and nicely sized for little hands. Innovative Design. The three-angled brush makes cleaning all tooth surfaces fast and easy. Stays Put. The suction cup holds the toothbrush in place, and little ones enjoy sticking it to the counter. Safe Material. This product is free of BPA and latex. Not for Chewing. Some moms said that this brush does not hold up well to young toddlers who like to chew on their toothbrushes. Hard to Clean. The unique arrangement of the bristles means that it can be hard to clean between them. Bristles Too Hard. Some moms said that they felt that the bristles were too hard for a toddler. Pricey. This toothbrush is more expensive than most toddler toothbrushes. The Scandinavian company Jordan is responsible for these cute toothbrushes with a kid-friendly design. 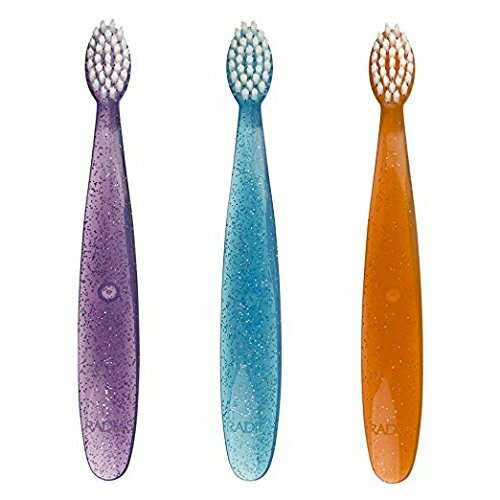 Toddlers and moms alike will enjoy the eye-popping colors of these toothbrushes. The round handle with a hole in the middle gives kids a good grip and can double as a teether. The brush has an area of colored bristles to show how much toothpaste should be used. The short neck of the brush prevents toddlers from gagging themselves. Jordan Dental Care is a company that has been in business since 1927. The Step 1 Toothbrush has won the Reddot Design Award. It is designed for children aged 0-2 years. The toothbrushes are made in Malaysia. Easy to Hold. The handle of the Jordan Step 1 Baby Toothbrush is easy for toddlers to hold and manipulate. Innovative Design. Moms like this safety-first design. Soft Bristles. Most buyers said that the bristles were soft enough for a toddler. Small Head. The brush head is sized small for a toddler’s mouth. Multi-Pack. These toothbrushes are sold in fours so you’ll always have a spare. Safe Material. This product is free of BPA and phthalates. Budget-Friendly. The price for four toothbrushes is very reasonable. Bristles May Come Out. Some users said that the bristles come out if chewed on. Hard to Store. The broad base means that these toothbrushes won’t fit in standard holders. 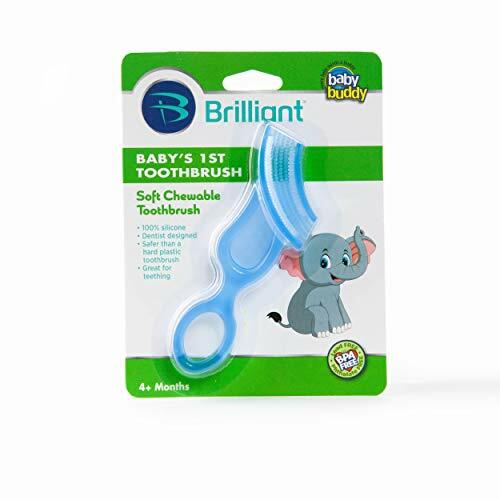 You might not see it at first, but the Dr. Brown’s Infant-to-Toddler Toothbrush is whimsically styled to look like an elephant, with the handle forming the trunk. Two “elephant ears” help to form the grip, and they also prop up the toothbrush so the part that goes in the mouth won’t touch the counter. The toothbrush has a flat bottom so you can also stand it up on the counter. The whole toothbrush is soft and easy for little ones to hold. It is designed for children from 0 to 3 years of age. Dr. Brown’s is a well-known maker of baby bottles and other products. The toothbrush is made in China. Easy to Hold. The soft handle of the Dr. Brown’s Infant-to-Toddler Toothbrush is easy for toddlers to hang on to. Cute Design. The elephant design may make toddlers more interested in brushing their teeth. Affordable. The price of this toothbrush is reasonable. Bristles May Come Out. Some moms said that the bristles come out if the toothbrush is chewed on. Hard to Store. The fat handle means that this toothbrush won’t fit in standard holders. What’s better than one toddler toothbrush? How about two? The MAM Learn to Brush set has a trainer toothbrush with a long handle that lets a parent help a child brush. It has a smaller toothbrush for when baby wants to practice brushing alone. The set comes with a shield that keeps the toothbrush from being inserted too far into the mouth. Both brushes have a soft nubbly tip that can be used to clean the tongue and massage the gums. The brush head also has colored bristles that indicate the correct amount of toothpaste to be used. MAM is a European company in business since 1976. Best known for pacifiers or soothers, the company makes baby products with input from its medical partners. The Learn to Brush set is made in Germany. It is designed for children six months old and older. Three Tools in One. 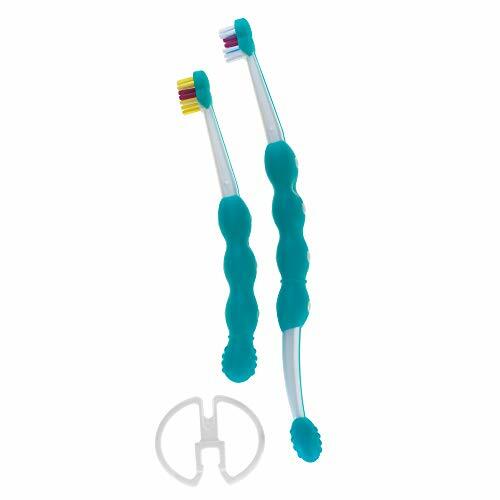 Each toothbrush in the MAM Learn to Brush set is also a gum massager and tongue cleaner. Great for Training. This set caters to a toddler’s need to be independent, while still letting mom help. Easy to Hold. The nubbly handle is easy for toddlers to grip. Affordable. The price of this set is reasonable. Issues With Shield. Many users said that the safety shield comes off or that their toddlers take it off. One way to get your child to brush is to utilize a favorite character. Orajel offers a toothpaste and toothbrush combo featuring four different characters: Spiderman, Daniel Tiger, PAW Patrol, and My Little Pony. The version that features My Little Pony comes with fluoride-free toothpaste in a flavor called Pinkie Fruity. One user noted that the toothpaste lasts about three months, which serves as a good reminder that it’s time to buy a new toothbrush. This combo is recommended for children from six months to three years of age. The toothbrush is made in China. Fun for Kids. Children definitely enjoy brushing with these character brushes by Orajel. Toothpaste Included. Most moms said that their children liked the taste of the toothpaste. Easy to Clean. Orajel suggests occasional sterilization by pouring boiling water over the brush. Affordable. This toothbrush-toothpaste combo is reasonably priced. Flimsy Material. The picture of the character is applied to the handle with a shrink-wrapped material, which wrinkles and is hard to clean. Radius makes its toothbrushes in its own factory in Pennsylvania. They are made using energy-efficient machinery, and the factory uses solar power. The company makes other eco-friendly products, such as Silk Floss Sachets that are completely biodegradable, including the package. Some Radius products have received the ADA Seal of Acceptance. Radius was founded by two architects with a passion for incorporating good design into everyday products. The first toothbrush they designed, now known as the Radius Original, is displayed in the Smithsonian Institute National Design Museum. The Totz, however, is their best-selling product in the United States. Eco-Friendly. Radius products are made in an environmentally friendly manufacturing facility and are recyclable and biodegradable to the greatest degree possible. Well-Designed. Totz toothbrushes are well-balanced and appropriately sized for use by toddlers. Easy to Hold. The wide handle is easy for toddlers to grip. Safe Material. This product is free of BPA, latex, phthalates and artificial dyes. Affordable. The price of this toothbrush is reasonable, especially when bought in a multi-pack. Bristles May Come Out. Some moms said that the bristles come out too easily. Too Large. Some moms felt that the brush head is too large for a toddler. If you’re looking for an electric toothbrush that’s gentle enough for a toddler, look no further. The Brush-Baby Baby Sonic Toothbrush comes with two heads, one for babies up to 18 months and one for 18-36 months. The heads are small enough and the action mild enough that most toddlers enjoy using it. And if you use an electric toothbrush, chances are that your child will be excited about using one, too. This toothbrush does not have the rotating heads featured on most adult toothbrushes. Instead, the entire brush vibrates, at 1600 strokes per minutes. 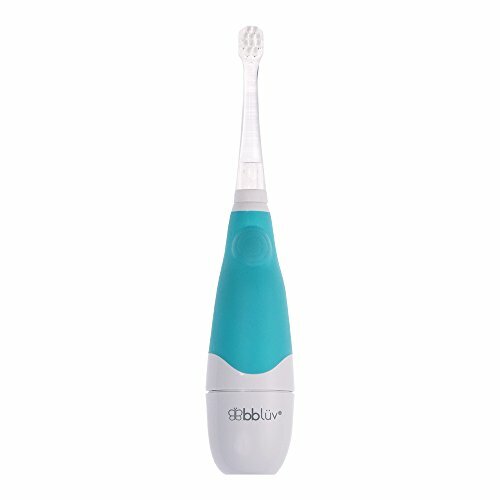 It comes with a light timer that goes out after two minutes so you don’t have to guess about appropriate brushing time. It also features a pulse that reminds the user to switch to a different quadrant of the mouth after 30 seconds. Requiring only a single AAA battery, the Brush-Baby Baby Sonic is inexpensive to operate, and replacement heads can be bought when the brushes on the original get worn. Like all toothbrushes of this type, it should be used only under supervision. 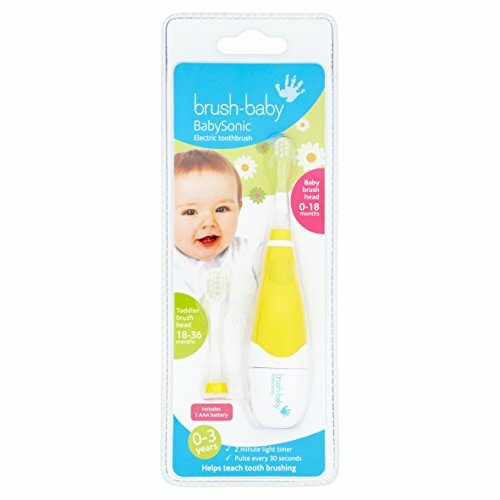 Brush-Baby is a UK-based company. The Baby Sonic is made in China. Toddler-Friendly. The Brush-Baby Baby Sonic is quiet and gentle enough to be tolerated by most toddlers. Replacement Heads Available. The life of this appliance can be extended by the use of replacement heads. Choice in Head Size. The ability to choose a smaller or larger head size means that you can pick the best brush head for your baby. Warranty. This toothbrush comes with a one-year warranty from the manufacturer. Affordable. The price of this toothbrush is comparable to other electric toothbrushes and is relatively budget-friendly. Head Too Small. Some moms felt that the brush head is too small to be effective. Another choice in toddler-friendly electric toothbrushes comes from bblüv, a new company founded in 2016. Headquartered in Montreal, its niche is products for children aged 0-2 years. Although the Sönik is recommended for ages 18 months and up, it’s gentle enough for use with a newborn. Like the Brush-Baby Baby Sonic, the bblüv Sönik comes with two sizes of heads and a body that vibrates rapidly but gently for a non-frightening experience. The Sönik features a super-bright LED light that goes out after two minutes and a soft silicone grip built into the handle. It’s also waterproof so you can feel comfortable rinsing it under the faucet. The toothbrush requires one AAA battery. The company website does not specify where its products are made. Toddler-Friendly. The bblüv Sonik is specially designed for toddlers. Replacement Heads Available. Extra heads are available at a reasonable price. Choice in Head Size. You can choose a smaller or larger head size according to your baby’s age and size. Affordable. The price of this toothbrush is relatively affordable and is comparable to other electric toothbrushes for toddlers. Light Doesn’t Show Up. The light is hard to detect in the bright light of a normal bathroom. The best toddler toothbrush is actually two toothbrushes. The MAM Learn to Brush set is sturdy and versatile, allowing a parent to guide the brushing or the child to brush alone. The implements are made in Germany and offer surfaces for chewing so that perhaps your toddler won’t want to chew on the bristles. 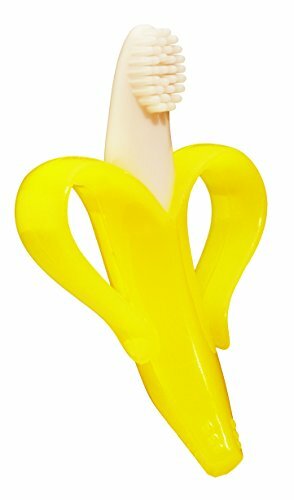 The Baby Banana is also a wildly popular product, but most users consider it more of a teether than a toothbrush. Moms who want to support the environment should be happy with the Radius Totz, and those who want to try an electric toothbrush should be happy with either the Baby-Brush Baby Sonic or the bbluv Sonik. Still, the Learn to Brush set by MAM will please a mom who just wants a safe, durable and non-toxic toothbrush for her toddler. It’s a great safeguard for that precious smile.